Armed with a dated iPhone 6 and portable charger, I headed to the Wyoming Union Gardens for my first live tweeting experience on Thursday, April 18, 2019. Two folk rock bands were set to hit the stage that night; The Two Tracks of Sheridan, Wyoming was headlining and The Locals opened. David Huebner, Julie Szewc, and Taylor Phillips of The Two Tracks play a song from their latest album “Postcard Town” at the Wyoming Union Gardens in Laramie, Wyoming, last Thursday. My goal for the night was to create at least 10 quality tweets from a public relations standpoint and post at least one video from the concert. I was able to reach both goals in a span of about two hours. The live tweets from the concert can be found on my twitter profile! I plan to pursue a job in public relations after college so I thought promotional live tweeting would be good practice. While comprising the tweets, I did my best to offer valuable information, but still connect with and foster a good relationship with my publics. In this instance my main public was college aged students who enjoy live music, although the audience was narrowed because I was tweeting from my personal account. The live tweeting experience went pretty smoothly for me, but there were a few awkward moments. First off, I felt slightly out of place at the event, which surprised me as I’m extroverted. Most of the audience members were in full concert mode – sipping on craft beers and socializing with each other. Then there was me, sitting in the front row with my eyes glued to my phone screen. Fortunately, I became more comfortable as the bands jammed on. On the flip side, I found myself happy about the awkwardness when reflecting on the event. I’m not typically one to attend events, especially concerts, on my own. This assignment allowed (shoved) me out of my comfort zone which is something I really value! Although, next time, I may take a seat more towards the back. Live tweeting is a very practical skill in the public relations field so I’m gad I got a little practice in. I plan to use this skill and others to emphasize an online professional presence on various social media outlets. This is so important because of how much you can engage with your followers! Next time, I would do two things differently. The first, I would interview someone who helped organize the event and secondly, practice using the application beforehand. I hadn’t logged on in a long while and accidentally tweeted one of my tweets as a reply to The Two Tracks’ twitter page so it only shows up under the “Tweets and Replies” tab. It’s okay to be the werido on their phone in the front row, no one is looking at you anyway. Randomly live tweeting an event on your personal account will result in some confused friends and followers. Do your research on the event beforehand in order to make the actual tweeting smooth. Although I was unable to include any memes and gifs in my series of Tweets, it was a lot of fun documenting a night of Americana/folk rock! Hopefully I’m able to apply this new skill in the future. Since starting college, the quality of my weekend meals has degraded drastically. I find myself reminiscing on my mother’s Sunday morning breakfast almost weekly. That’s why I’ve resorted to hitting up Laramie’s breakfasts spots on a regular basis. Most college students probably find themselves in the same situation as me: hungry and motherless. After resorting to someone else’s cooking, given your cooking abilities are as limited as mine, you’re faced with the decision of where to eat. As broke college students, the places we choose to spend our money must be worthwhile. There’s nothing worse than paying for overpriced food that doesn’t leave you satisfied. No fear! With this list of Laramie’s top five best breakfast spots and an interactive map to guide you on your quest for food, you won’t have to spend a fortune for a yummy plate. In addition to the convenience of knowing the best breakfast joints, the options this map features will ease the stress of finding a table for Sunday brunch. If one restaurant’s wait is too long, there are four other great places within a 6 mile radius. “I can’t tell you how many times I’ve gone to get brunch and been told there’s 45 minute wait. I’m hungry now!” said UW student Faith Waitsman. One of 17th Street Cafe’s more popular menu items, breakfast tacos wait to be devoured. Photo courtesy of 17th Street Cafe. 17th Street Cafe is the ultimate spot for breakfast in Laramie. Their menu features the classic breakfast staples like pancakes and bacon, but the true gold is found in their breakfast quesadilla. Served with homemade green chili, the quesadilla is plenty big to feed two people – major bang for your buck! 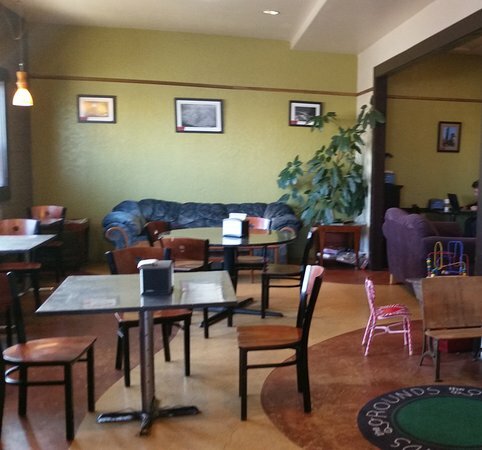 The cafe is also conveniently located right across the street from the dorms on the UW campus. 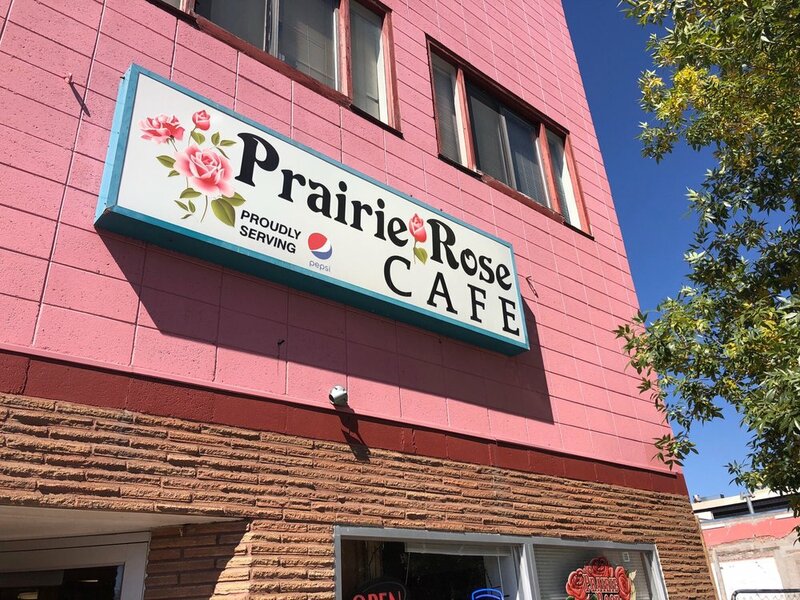 The iconic pink Prairie Rose sign sits above the entrance, where hungry customers enter. Photo courtesy of Yelp. Prairie Rose, my mom’s personal favorite (which says something), is a smaller restaurant in downtown Laramie. I’ve always appreciated the restaurant’s offering of coffee while you wait, but the hospitality doesn’t stop there. The service is top notch and so is the food; although, if you want a cinnamon roll, you should consider getting there sooner than later. The sweet pastries are well known around town and often sell out by 11am. Customers chat and relax outside of Turtle Rock Cafe, enjoying the sunshine. Photo courtesy of LaramieChamber Business Alliance. If you’re more into coffee shops than full on restaurants, Turtle Rock is perfect for you. The outdoor seating is lovely in the spring in summer, but the inside is a peaceful environment as well. Their seasonal specialty drinks go well with the scrambler bowls. Being coined a coffee shop doesn’t reflect the quality of their food, as they go way above and beyond Starbuck’s muffins and scones. A customer favorite, Eggs and Muffins, is plated for a hungry customer at the Chuckwagon is Laramie, Wyoming. Photo courtesy of The Chuckwagon. The Chuckwagon gives me serious cowboy vibes, highly appropriate for any UW student. The inviting barn-like exterior matches the homey feel of the inside. Chuckwagon’s overall feel extends to the breakfast, all of their food tastes home cooked in the best way possible. “The breakfast burrito at Chuckwagon is to die for,” said Waitsman. A seating area in The Grounds sets a comfy mood for customers in Laramie, Wyoming. Photo courtesy of Trip Advisor. The Grounds, similar to Turtle Rock, is a great study/breakfast combination spot. I love the iced white chocolate mocha with a blueberry scone. Many customers like to play the complimentary board games for a study break or post breakfast activity. Laramie has some undeniably delicious breakfast joints, but these top five offer the best quality food for great prices. Next time you’re missing your mom’s cooking and want a great meal grab a friend and chow down. “Breakfast is the most important meal of the day, thankfully Laramie kills it in the breakfast department,” Waitsman said. John Cacianti shoots a grin after reminiscing on some of his adolescent freight train riding adventures. I brought up the idea of interviewing my stepdad, John Cacianti, over pizza on a Saturday night. He seemed to light up when I asked him, flattered that I wanted to hear his stories. I was excited too! I had known that my parents took part in some interesting adventures in their youth, but the conversations never seemed to dig very deep. “Train hopping” and “riding the rails” would come up in family discussions around the holidays, but I wanted to know more – this was the perfect opportunity. Fortunately he was blessed with the gift of gab which gave me a lot to work with. Cacianti and I did two takes of the interview as the first was a little awkward. After the second take, I knew I had something solid to work with. After previously doing audio recordings with strangers, this one, with my stepdad, didn’t feel too stressful. Although my experience helped, one challenge I faced was finding a place to put my recorder where fidgeting was inaudible. My interviewee tended to tap his finger against the table, which I asked him to refrain from doing the second time around. After this fix, the interview went smoothly. This was my first time ever editing audio, but I actually enjoyed it. I found a lot of satisfaction when the transition between separate clips of audio meshed well! This wasn’t always the case because more drawn out speech made those transitions harder to edit. My least favorite part was converting files. Taking my stepdads portrait was pretty comical. Directing friends in how to pose for Instagram photos translated well into this situation, although he was a bit more stiff than my usual subjects. I remembered to take quite a few pictures – the first 15 were mostly practice shots to allow him to feel relaxed. I had a hard time tying the freight train story into the portrait. Cacianti leaned against a wall, sat on a tree stump and held our family dog, Alfie, in the photos in order to diversify my options. In the end, I chose an outdoor shot that included some rustic tones in the background to evoke feelings of adventure. Reflecting on the assignment, I was surprised by how well it went. I expected the editing to be a bit of a road block, but it turned out to be pretty fun! If I could do this assignment again, I might do one more take of the interview and collect a loner ambient noise clip. There was such an improvement between the first two takes; I’m sure a third would’ve been even more polished. The biggest takeaway from this project for me was the importance of making the subject feel comfortable. I will keep this in mind when implementing audio into my future career. I hope to work in the public or media relations department for a nonprofit organization. A big factor of nonprofits’ success are donations and an organization is more likely to receive donations if they can target their publics’ emotions. Creating a podcast where those benefitting from nonprofit work can share their hardships and triumphs is a practical PR plan to increase publics and, in turn, increase donations. This form of audio may even attract people not previously involved with the organization which could stand as an entirely new public. I look forward to experimenting with audio and hearing more of my stepdad’s crazy stories! A light snow falls on Nu2U’s exterior as shoppers hunt for pieces inside on Saturday. There’s always been a market for vintage and thrifted fashion, but the industry has grown into much more than a way to find unique pieces of clothing. Although there are some fans, other people find the negative stigmas surrounding second hand shopping to be true. Those in Laramie who are in favor of used goods often shop at thrift chain Nu2U. The company has two stores, Nu2U and Nu2U Sports, both located in downtown Laramie. Nu2U employee Star Siedenburg said Nu2U’s business goes beyond accepting donations and reselling them. The store features a consignment resale program with over 10,450 members and frequently makes donations to those in need with the goal of contributing to the reduction of waste and supporting the community. “It’s so awesome how the whole community regularly brings their clothes here. We’ve cut down on a ton of waste in town,” Siedenburg said. The fast fashion industry makes clothing that is trendy and inexpensive. Environmental activists think lowly of the practice and encourage buying second hand instead. According to Attitude Organic, shopping mall staples including Forever 21, H&M, and Victoria’s Secret all partake in the selling of disposable clothing, sacrificing quality, ethical labor practices, and environmental consciousness. Additionally, according to The Green Hub, a sustainable fashion and lifestyle magazine, eighty billion articles of clothing are purchased globally every year. This vast amount of material requires a multitude of resources, all of which are minimized when purchasing previously used clothes. Siedenburg explained that Nu2U tries to do its part by donating extra articles of clothing to the Clothing Cottage in Laramie. Also, any clothing that is not fit to be sold is restored and sent to clothing banks in Africa. Another point of interest for thrifting is the price differential. With profit in mind, fast fashion retailers will often charge high prices for clothing that costs pennies to make. Thrift stores like Nu2U, however, sell clothing for a fraction of their original price. “I like the discounts of thrift shopping and its uniqueness. Now that I live in little old Laradise, I never shop at chain stores!” Emily Dyson, Nu2U shopper, said. Avid thrift shoppers feel that buying cute clothing and supporting sustainability are not mutually exclusive. They admit that rummaging through racks of random clothing in thrift stores may take more time, but they consider the benefits to outweigh the costs for the sake of the environment and their wallets. “Thrifting is a great hobby! It’s super fun to go see what’s out there and it’s a good opportunity to be creative with what you buy and wear,” Katrina Norris, Nu2U regular, said. Boots and pants await their buyers in Laramie’s Nu2U. Beyond shopping, many thrift stores like Nu2U, offer consignment and donation programs. This process starts with people bringing in used clothing, then employees pick (depending on brand, quality, and season) what they find up to par for the store. At Nu2U, upon sale, the seller receives fifty percent of the store chosen price of the item. There are also donation options for those simply wanting to do a quick closet clean out. Following the popularity of the Netflix series “Tidying Up with Marie Kondo,” minimalism has been on the rise. Kondo’s philosophy on organization features asking yourself if the item on the chopping block sparks joy. If the answer is no, ditch it! When asked about Kondo, Norris said she tried to implement the strategy in January, during her last purge. “Clothes and possessions aren’t permanent. Purging is so cool because when you’re tired of something, you can go get something else that does bring you joy,” Norris said. As they say, one man’s trash is another man’s treasure! Upon walking into Nu2U, customers are faced with walls of fringy leather jackets and racks of funky dresses. By accepting so many clothes through consignment and donation, the shop has an ever changing supply of one of a kind pieces. “My absolute favorite item I’ve found thrifting is a sweatshirt with the word ‘ski’ stitched across the front. There’s also a little man skiing on the front of it!” Dyson said. Every item that is accepted through consignment as well as some donations are housed in the upstairs portion of the store. They live there for about three months and then move downstairs to the fifty percent off section. The purpose of this is to give buyers the best chance to find items that they love. Nu2U’s pursuit to offer the Laramie community a source of uniqueness will continue until the donations and consignment stop. The business is hopeful that items once loved by previous owners will continue to feel truly new to you. “Life is too short to care whether or not you’re spending ‘enough’ money on clothes. Who wants to look the same as someone else anyways?” Norris said. Special Olympics athlete, Timmy Frazier, pencil-dives into a pool of ice cold water on Saturday. Frazier took the plunge in 30°F Laramie weather at the 2019 Jackalope Jump in order to raise money for Wyoming Special Olympics. After hearing about this event from a friend, I was confident that I could get some unique and interesting photos. The element of water played a part in this shoot that I was yet to experience. I had to stay a ways away from the pool for safety reasons and to keep my camera dry. The rule of thirds used in this photo makes it aesthetically pleasing – plus it’s a super fun one! I felt lucky to capture such a special moment. University of Wyoming wide receiver, CJ Johnson, winces as David Milam dry-needles his sprained ankle in the High Altitude Performance Center on Friday. Johnson partakes in dry-needling on a weekly basis in hopes of speeding up the recovery process. David Milam routinely comes in on Fridays to needle athletes so I stopped by the training room to see if I could capture a sports feature photo. The mood was tense because Johnson was in a good amount of pain while being needled. I felt a little insecure and odd taking pictures of someone experiencing such discomfort, but managed to quickly get a picture exemplifying leading lines. JJ Chen, University of Wyoming tennis player, holds still for her annual dexa scan on Sunday in Laramie. The scan provides information about bone density and muscle mass, both vital pieces of information for the UW sports medicine team. This was one of the easier pictures to capture because Chen was already so still. I was informed that the machine in the photo was similar to an x-ray, only more powerful. I didn’t want to ask, but I was secretly worried that the rays would interfere with my phone/camera and break it somehow. Fortunately the phone is still in one piece! As far as the picture, I like the way the color of her shirt stands out against the table. Nick Winn cracks a joke to a Jackalope Jump volunteer on Saturday as he selects his complimentary shirt. This was Winn’s second time participating in the Laramie polar plunge, not having participated since 2015. After hearing about the Jackalope Jump, I tried to brainstorm photos I could take other than the actual jump. I thought it might be cool to capture an image of someone registering and anticipating the plunge. After asking if I could stand behind the volunteer’s table, I was feeling bit awkward. The pictures I was taking of Winn were coming out blurry because of the lack of natural light and then – AhHa! – he made a joke and I was able to capture a more interesting photo with emotion and the rule of thirds. University of Wyoming Olympic Sports Nutritionist, Shae Carson, reviews a student athlete’s body fat percentage on her computer monitor Sunday in Laramie. Carson uses previous measurements in order to evaluate the effectiveness of diet and training. After doing some studying on campus, I saw that the athletic nutritionists were in the building. I decided to pop my head in and was pleasantly surprised to see them working on the body fat scans. Photographing older professionals was definitely out of my comfort zone and I feel more confident with this shoot under my belt. This photo uses balance as the creative device. I expected to feel pretty awkward photographing strangers. That held true! I consider myself to be outgoing, but this assignment was undeniably nerve-wrecking. Looking back, I think I would prepare more. My lack of planning mixed with the stress of shooting strangers in a new environment left me with average photos. With more preparation I should be able to attain a more complex top 5! Despite the 275 photos on my Instagram profile, my photography skills were limited to goofy selfies and travel pics – until this week! As my phone storage dwindled and camera roll grew, I learned that you’ll take A LOT more bad photos than good. Sorting through my pictures, I found some were blurry, some boring, but a few that weren’t too bad! Let’s take a look at my top 5 photos from the week and the creative devices they exemplify. Minuscule white hairs grow from a succulent on display in the Williams Conservatory at the University of Wyoming. The plant’s details replicate goosebumps forming on skin in the cold. Pattern is the dominant creative device here. The repetition of the leaves and flow of the stems creates interest in this picture which draws the viewer in. By focusing on the leaves, the viewer is able to appreciate the detail of the living and dead parts of the plant. Color is another device present in this photo. The fresh palette of pinks, oranges and greens compliment each other nicely. The earthy tones are eye-catching, but also induce a sense of calmness. A monochromatic painting of American criminal, Butch Cassidy, glares from a doorway off of Grand Avenue and 2nd Street in Laramie. Numerous fascinating pieces of art can be found in the alleyways and on buildings of Downtown Laramie. For the dominant device, the red brick acts as a frame to the portrait in this picture. By surrounding the painting in a continuous material, the viewers eye is brought to the focal point of the photo. The worn brick is complimented by white electrical boxes which add another aesthetically-pleasing point. In addition to framing, contrast is very evident. The black and white hues of the man are brought out by the electrical boxes while the different shades of red brick make the portrait pop. The Wyo Theatre offers some words of wisdom on Sunday afternoon. Signs of optimism and life dominate the boarded doors, rebelling against the theatre’s closing in 2014. The navy blue, bright aqua and red featured in this picture are the reason for color being the primary device. The focal point in this picture is the writing on the marquee. The combination of cool tones perfectly sets the stage for the red script. Although the theatre sits in the middle of the photo, the secondary device is the rule of thirds. The negative spaces on the sides and above the focal point offer balance and are aesthetically pleasing to viewers. Giant cacti in the University of Wyoming Williams Conservatory extend towards the sun Friday morning. These cacti are among the 500 plant species housed in the conservatory. The metal window frame spouting from the bottom right corner of the photo leads the eye to the cacti and glowing light. This example of leading lines engages the viewer, prolonging their gaze. Another creative device in this photo is the creation of depth. The grid created by the white bricks and metal frame show the distance from where the photo was taken to the focal point. The dark colors of the windows on the right also add an intriguing element of depth. Grooves in the trunk of a young Ponytail Palm Tree in the Williams Conservatory mimic valleys. Currently standing at 4 feet tall, the tree reaches 10-15 feet at full maturity. In this picture, texture is the primary creative device. The larger cracks in the tree bark are emphasized by smaller surrounding rifts. The cracks capture the viewers attention by becoming deeper and resembling veins stemming from the top. As for the secondary device, the symmetry and patterns add to the aesthetics of this photo. The repetition of angular ovals in the bark are fascinating for the viewer. While shooting for this assignment, I mistakenly attached the quality of my photography to the quality of my camera. I assumed that simply because I was shooting on a phone my pictures wouldn’t turn out very well! Fortunately, I was way off and was able to capture some pretty cool things! If I could do this assignment again, I would shoot in more places. I often appreciate the beauty around me, but don’t always remember to pull out my camera and capture it. Here’s to the beginning of a brand spanking new blog! As a hands on learner, I’m really looking forward to practicing and adding my own flare to the concepts I am studying. I expect to gain more experience writing for the web, creating digital media content and blogging. Anticipating myself gaining this knowledge eases my stress about entering the work force in two short years! Photography is one skill that I’m particularly looking forward to! My fascination with pictures began in middle school and I’m currently on a disposable camera kick. I hope to get better at framing and balancing elements. Last summer I spent some time taking photos with one of my good friends, Laurel. She has some mean camera skills and just launched her photography website https://www.picsbyplace.com/. After college, I plan to get a job in public relations. Chatting with veterans in the field has lead me to understand the value in being a well rounded candidate. This inspires me to hone in on my work for this class and sharpen my multimedia skills. As far as the the content of this blog, I think it will be an accurate reflection of me: scatterbrained. In a charming way? My love for the outdoors leaves me wanting to explore Wyoming. I’ve spent time in the Snowy Mountain Range and Vedauwoo and want to expand my horizons to the rest of the state. I’m considering creating a post on the best outdoor activities in Wyoming. Wildflowers bloom in Medicine Bow National Forest in July, 2018. I’ve also always been curious about sustainability, but don’t know a ton about it. Reporting on the effectiveness of sustainability efforts on the University of Wyoming campus sounds right up my alley. This idea could also extend to current events and politics. Additionally, I’m sure there will be a mix of posts about music, home decor and baked goods. The smorgasbord of all blogs!